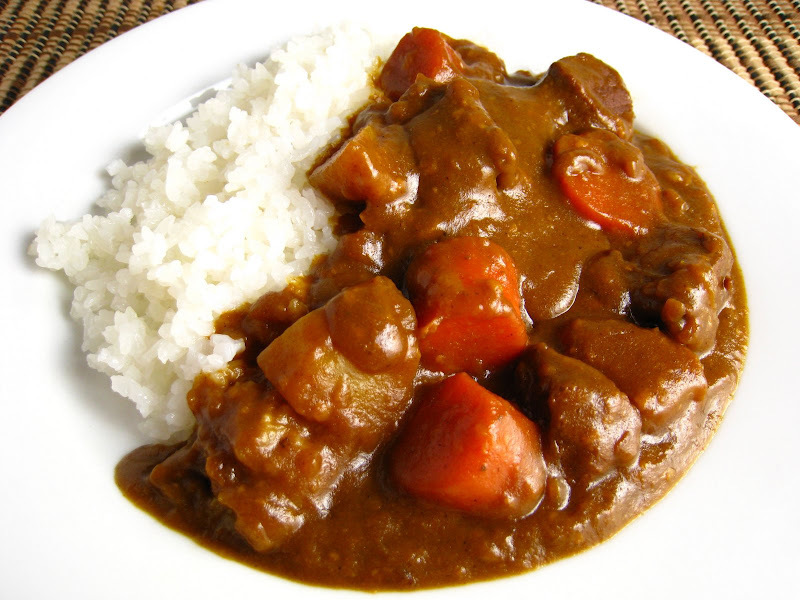 Japanese curry is easy to make, cheap, and can be really good if you make sure you get a couple things right. Goes great with Kimchi! Labor Intensity: Could do alone, but 2-3 people to help cut vegetables would help. Get the suggested amount of water on the curry box and use 1/2 of it. Pour into stock pot and heat on high heat. Peel and cut potatoes, onions, carrots, all into 1-2 inch bite size pieces. Put vegetables into pot as soon as they are cut and turn stove to medium heat. Potatoes take longer to cook so make sure they go in early and that they are not cut too big. Stir for 10 minutes for curry to dissolve and get thick. Add 10 slices of American cheese and stir until dissolves. Add remaining portion of water slowly and stop when it reaches desired thickness. Having 2-3 people help you can really speed things up. They can peel and cut and when they are done, they can wash the cutting boards, knives, and everything else. Why start with so little water? I have experienced so many times when people make curry that is too watery. It happened to me the first time. There is water in the vegetables and meat that comes out during cooking and dilutes the curry. I had to drive to 3 safeways across Berkeley to buy extra curry before small group. I'd rather start with extra thick curry and add water to it in the end to slowly control the thickness. I'd much rather have it 10% too thick than 10% too thin. As a result, it may be more concentrated and 12 servings on the box may be more like 10 servings cooked. I would buy an extra box of curry if you think you might need more. [EMERGENCY RECOVERY] If you made curry that is too watery, you can add corn starch to thicken it. Just mix some corn starch (1/4 cup at a time) with a little cold water to dissolve. Then add to hot curry and heat for 5 minutes to thicken starch. Esther Kang told me that in Japan, they add cheese to the curry. I was a bit skeptical at first, but it really makes it smoother and very savory! Dicing the curry blocks will expose more surface area and allow it to dissolve faster. Using "stew meat" (pre-chopped beef chuck) is about $3.50-$4.00 at safeway and costco. In terms of meat flavor and quality, it is completely overwhelmed by the curry flavor to the point that almost any meat will work. (Even when a certain sister put filet mignon into curry after a camping trip!). If you use $1.49 chuck or pork shoulder, you can save over $20 for that meal and no one would notice! Stir frying the meat will cook the blood that drips out. If you place raw meat directly into the boiling water, you will get a brown foam as the blood coagulates. Make sure the meat is in the hot water for at least 45 minutes before addition of curry. This will make it very tender. Too many curries I tried had tough meat. Cheaper meat requires 45-60 minutes in boiling water to get tender. I know what you mean. I made watery curry the first time! I would maybe use 2/3 the water instead of half if the vegetables are not submerged. Good tip on adding water later! By the way, if you want a little bit of a twist on Japanese curry, add some apples to it. I prefer Gala apples, but I'm sure anything sweet will do. The sweetness really brings out the curry flavor. i have no idea how to cook and i tried this recipe-for the first 10-20 minutes you will be wondering how in the world there will be enough water to cover the vegetables, but wait it out!! it will come out!! what kind of cheese do they add to the curry?